UK Uncut are planning an unprecedented act of civil disobedience at 1pm on Sunday 9th October in protest against the government’s NHS reforms. 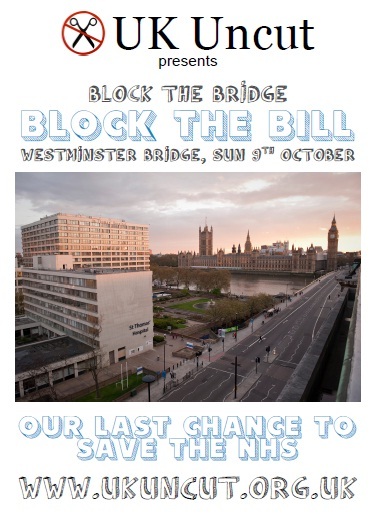 Over one thousand people have already announced their intention to participate in the action, which aims to demonstrate the level of public opposition to the Bill and put pressure on sympathetic peers in the House of Lords by occupying Westminster Bridge. The activist group are also encouraging people to contact peers and ask them to block the bill. Full details of the demonstration can be found on the UK Uncut website. There is also a Facebook event page.